Pamporovo is situated high up in the Rhodopi mountains at the foot of Snejanka Peak (1926m). 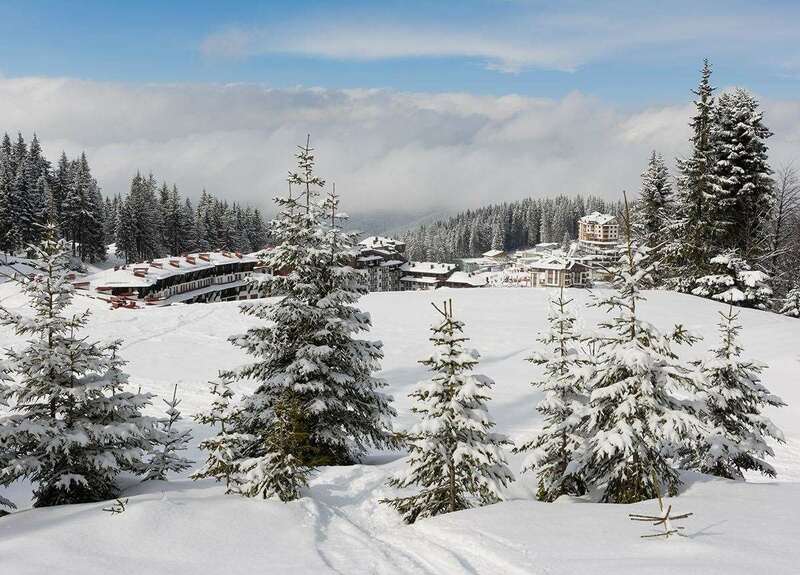 With its rounded slopes and summits this Bulgarian resort is ideal for beginners and intermediates. For advanced skiers there are difficult ski runs like "Stenata" (‘The Wall’). 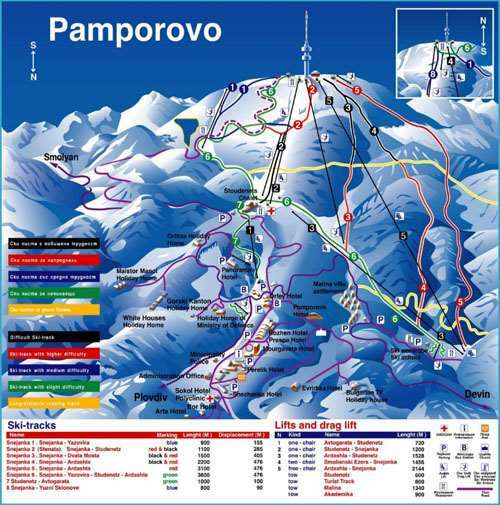 The hub of Pamporovo comprises a number of excellent hotels and bars. It is also one of the southernmost skiing resorts in Europe. Pamporovo is the sunniest Bulgarian mountain resort. The winter here is soft with 120 sunny days. The ski pistes are covered with snow throughout the whole skiing season that lasts from December to April. Confident intermediates and advanced skiers will find a World Cup run and some interesting through-the-trees off piste but this is really a resort for beginner skiers and snowboarders who want to learn and progress.The long greens and blues, as well as the nursery slopes down in the village are ideal for learning and progressing on. Ski instruction is of an extremely high standard and, because Bulgaria is so easy on the wallet, individual tuition can be very affordable. Many of the instructors also speak English fluently. The apres-ski and night life in Pamporovo is quite lively and there are no places that look similar. The White Hart (between Hotel Perelik & Hotel Mourgavets) is a traditionally designed pub that has been reported as the party hot spot this winter. Other popular places are BJ's (inside Hotel Perelik), Dak's Bar (insidehotel Snejanka) and Night Flight (inside hotel Rojen) a new club, largest in Pamporovo. Other activities that you can enjoy on ski holidays in Pamporovo include bowling, historical excursions, swimming and shopping. I visited this resort for the first time last week (23/02/09). I had the most wonderful skiing experience. It is such a beautiful resort. I have never skied in such an alpine environment - trees lining almost every run. I have read bad reviews about Pamporov - mainly about the snowfall. If you pick it right (don’t risk going very early or late unless it is a last min booking) then you will have a fantastic time - at a 3rd of the price of Western resorts. I will definitely be going back next year. I booked a double apartment for the week over New Year to sleep 4. Firstly the apartment was far better than expected. Brand new, excellent facilities and huge! The views over the Snezhanka peak were fantastic and the facilities in the hotel are great. Try finding a hotel in the Alps with a pool this nice. The resort is very picturesque with some beautiful tree runs and while it is suited to beginners I was more than able to challenge myself on the mountain and put my 20+ yrs of experience to the test on occasion. My friends who were beginners loved the ski school and have an invite back to Plovdiv to visit their instructor! Nightlife is as lively as you want to make it and, if you stick to the local delicacies, the restaurants serve some tasty bargains. Thoroughly recommend the hotel and resort and if you're looking for something a bit different there's a whole new world around the resort to satisfy the wanderlust. We're booked in for next year!